Welcome to the new Jose Madrid Site! **Note that all our Mix & Match products include free shipping! We will be around the Midwest U.S. in the next coming months showing our salsa and giving the people what they love. That's right, free salsa tasting. This is the opportunity that salsa loving Americans can really sink their teeth into. We will be releasing our show's schedule soon, so please check often, because we may be coming to a place near you. And I guarantee that we have a salsa that you will love. 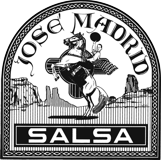 We want to thank all of the visitors from around the World and hope that you will continue to enjoy Jose's fine salsas. Thank all of you!